Each year we have several events, including our annual race and celebration banquet, worth traveling for! Our 18-week signature training program in the midwest culminates in a 5k/10k/kids run while our annual banquet the same weekend celebrates the hard work you've done over the season. We also have a variety of races that we've partnered with, many which offer team discount codes for savings. Our 18-week spring/summer peak training season in the midwest culminates in August with the Moms on the Run race experience in the Minneapolis-St. Paul metro. For many women, this milestone marks the first race of their lives, a goal they began working toward in the spring. We welcome members and non-members from all 40-plus locations nationwide. 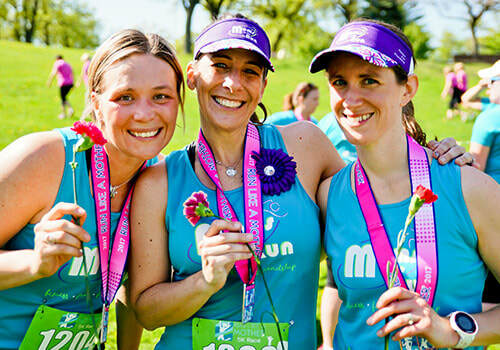 ​All of the excitement and momentum that comes from completing the Moms on the Run race event is carried through in our celebration banquet each August in the Minneapolis-St. Paul metro area. We welcome members and non-members from all 40-plus locations nationwide. Aside from the MOTR 5k/10k race, we enter into official partnership agreements with other great events throughout the year.